Tamagoyaki is a japanese style omelette that is often found in bento boxes. I love having this convenient bit of tasty protein in my lunches. Sometimes I add herbs or wilted greens to it, but often I keep it simple like this one. I do season it with salt and mirin, and sometimes a bit of soy sauce and a pinch of sugar. I use a special pan for making tamagoyaki, but really you can make it in any pan you'd like. It is simply a rolled omelette. 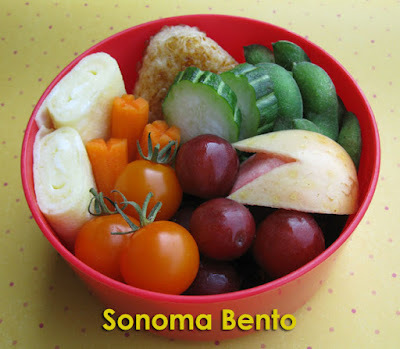 Also in this bento: yakionigiri rice ball from Trader Joe's, steamed edamame, slices of armenian cucumber from Redwood Empire Farms, a mini apple rabbit made with a Pink Pearl apple from Triple T, grapes, orange cherry tomatoes from the Oakmont Farmers Market, and a few baby carrots. Voting has begun for Hapa Bento's Back to School contest. You can visit her facebook fan page to vote and also get more great ideas for packing your own bento. Have a great Monday! I love the balance in this compact bento! The pink pearl apple is too cool. I hope I can find them in the east bay. And your tamagoyaki is perfectly rolled. What a neat job! Good luck in the Hapa Bento contest! Thanks sheri! Your entry in the hapa bento contest is awesome! I got a new tamagoyaki pan. It is the bomb. Hi Lia! Yes, the flesh of the apple is a light pink. It is really cute! Hi tatabonita! Tamagoyaki is perfect for bento. So tasty and convenient.